Today is the big day! 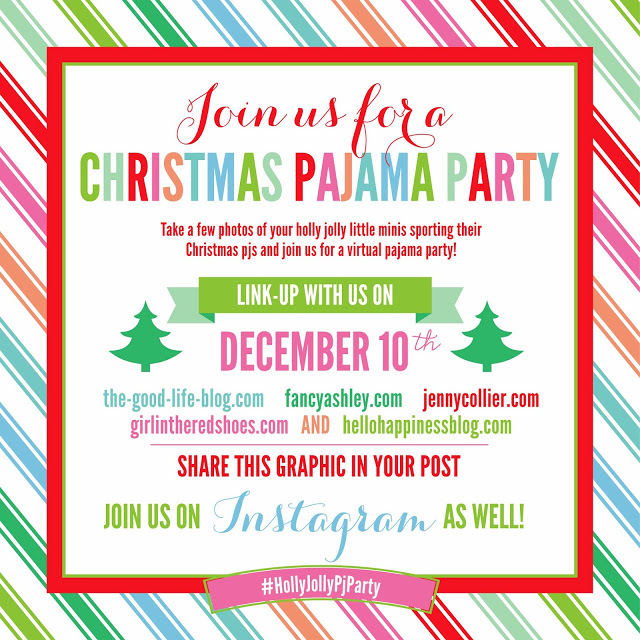 Welcome to the Christmas Pajama Link-Up Party! 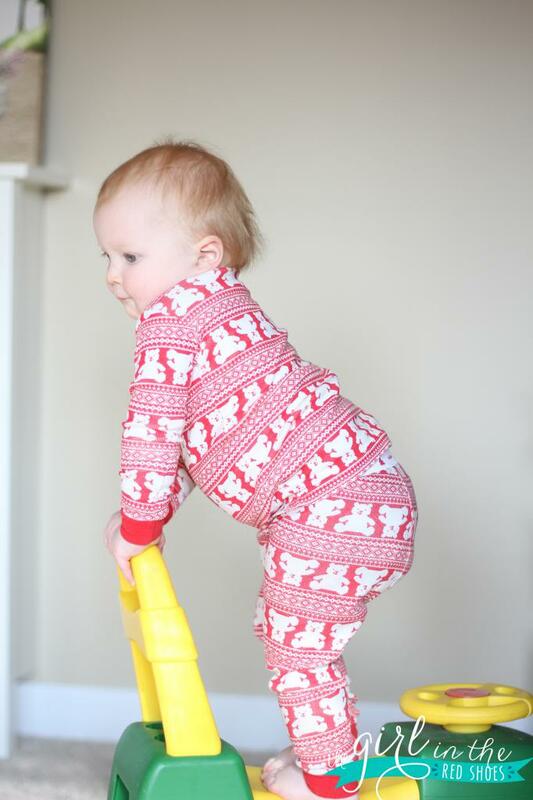 What’s more fun than cute kiddos in cute jammies? Confession: I love jammies. Any excuse to dress Hudson up in cute jammies is a reason to celebrate in my book! Hudson is happiest when he is in his car so that’s the first thing I did to attempt to get some photos of this busy 15 month old boy! It also doesn’t hurt that mommy had on reindeer antlers and was singing funny Christmas songs. Whatever works, right? This boy has my heart! Hudson looks so cute in green…..I couldn’t resist buying these jammies as soon as I saw them at Target…I think it was back in September! They are by Carter’s and can be found (on sale!) here. Hudson caught on to my camera trickery and wanted nothing to do with smiling for the camera and refused to sit still. 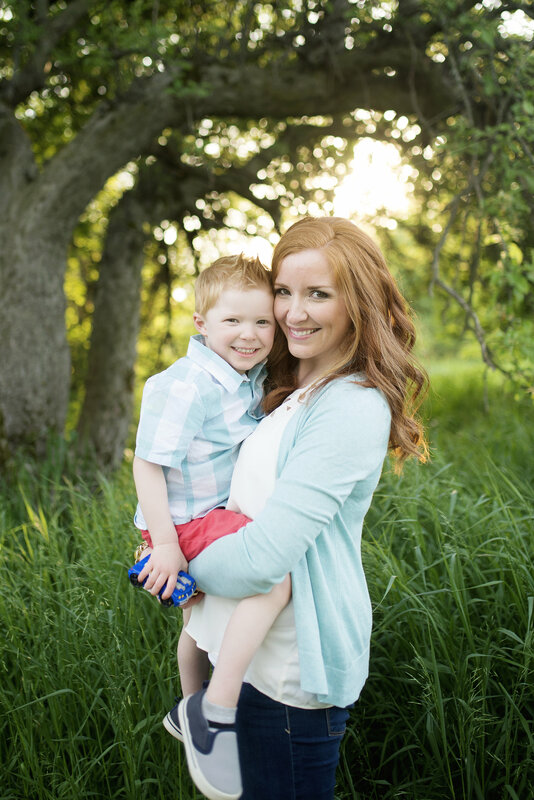 So I did what any mommy blogger would do….I bribed him with a vitamin C lollipop of course. Mother of the year, right here! 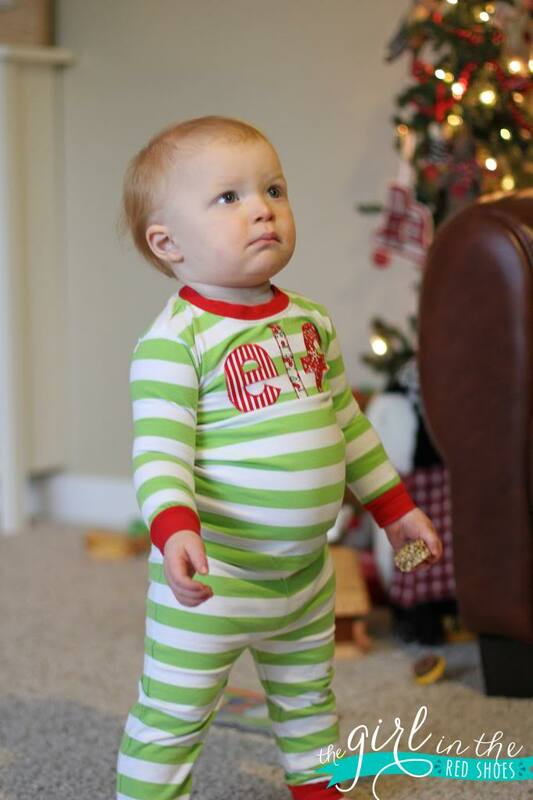 Too bad he was too busy eating his lollipop to smile….these are my absolute favorite Christmas jammies from the gap. 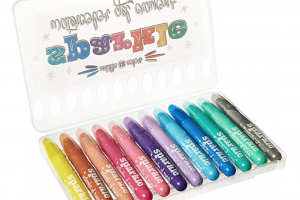 I think my entire circle of bloggy friends has these for their kiddo…they are just too cute! My little reindeer! These photos make me want to freeze time…I just LOVE this stage! 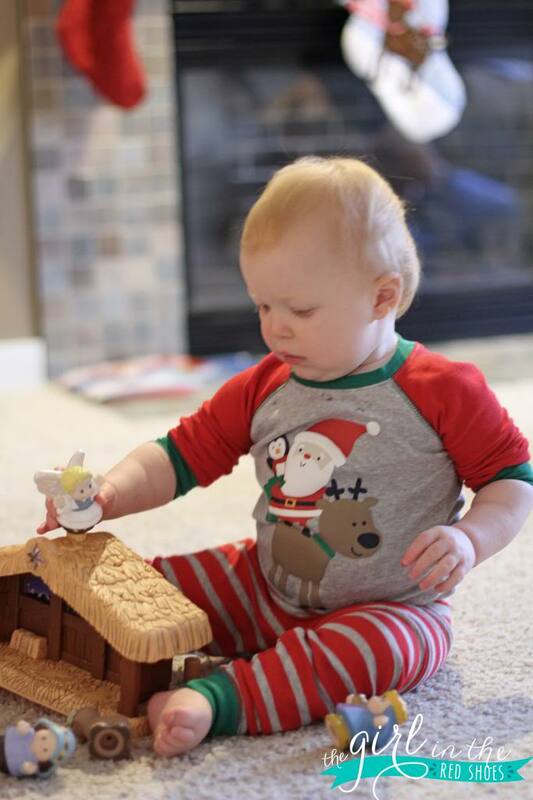 Hudson is obsessed with his Little People Nativity Set…which makes me so happy! Santa with reindeer and penguin jams by Carter’s, found (on sale!) here. I bought these green striped pajamas several months ago and had my mom embellished them…..such a cute idea that I plan to do every year! That little belly just kills me every time! 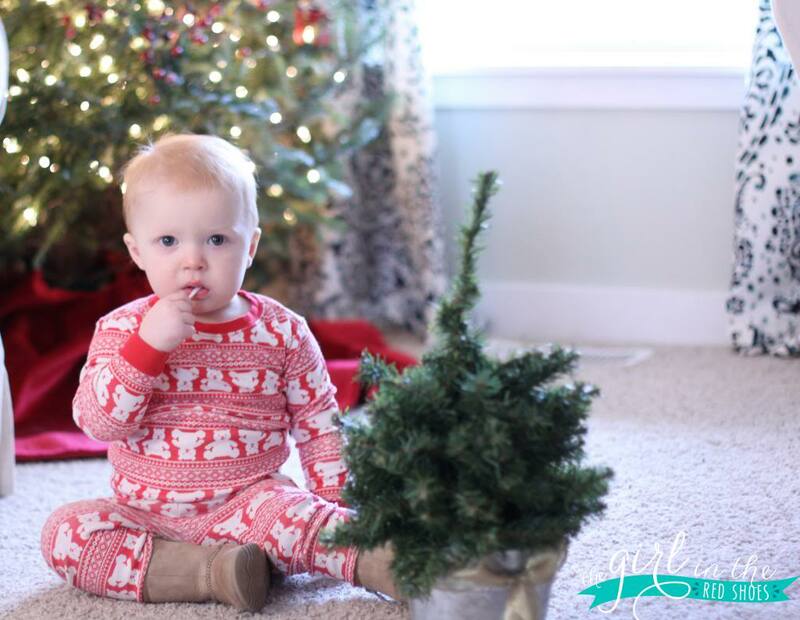 There is something so sweet an innocent about a babe in Christmas jammies….it has me SO excited for many fun memory-filled Christmases to come! And of course…one more shot in our favorite jams on our favorite tractor! Link up below! I can’t wait to see all of your littles in their cutest jammie jams! He is adorable! Soooo many cute pjs! Sorry my link up thumbnails never seem to work…iPads and iPhones are no good for this stuff! 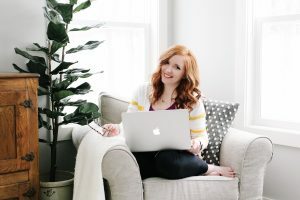 Just discovered your blog through the PJ link up and it's adorable. The picture of your son in those Elf striped PJ's with his belly out is the cutest thing ever. I love those sweet baby bellies. I look forward to be a new follower. Thanks for hosting! Oh my goodness what a little ham. Him in his car…i die! Such a happy boy! the Elf pj's, omg they are TOO cute! And the Moose hat…. Hudson is such a cutie. I love the red pj's from Gap! I think those are my favorite. 🙂 He's too cute riding around in all his cars! Look at how sweet he is!! 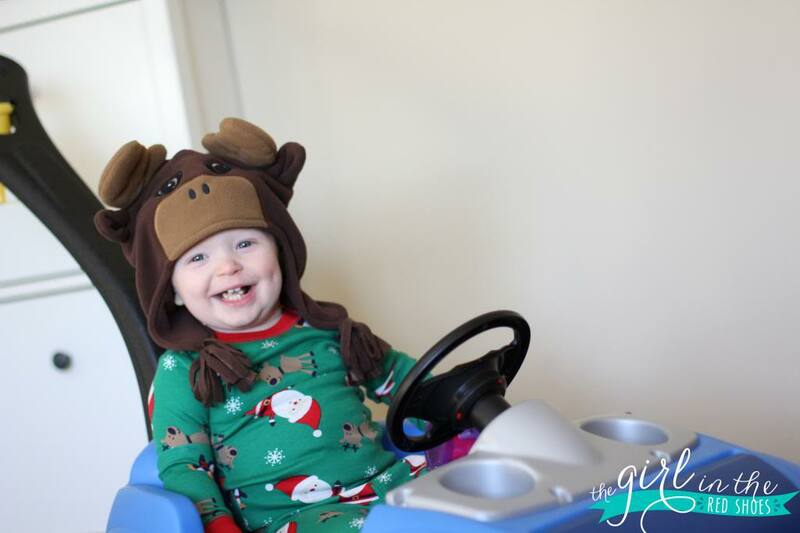 Oh my gosh – those reindeer antlers are so adorable, and that smile! I love the red teddy bear pjs! I tried to order them but they ran out! We love the Little People Nativity set here too! I love Hudson in his adorable pjs!!! Oh my goodness I LOVE all of his pajamas!!! Yay for jams!!! Love him in all of his holiday jam fun!! He's so cute in his car with the hat- perfection!! The Gap jamjams are my absolute favorite!!! Vitamin C lollipop? You are one amazing Mom! My kids still love the little people nativity set and they are 5 and 7! It is just fun to put it under the tree each year and I don't have to worry about it getting broke. 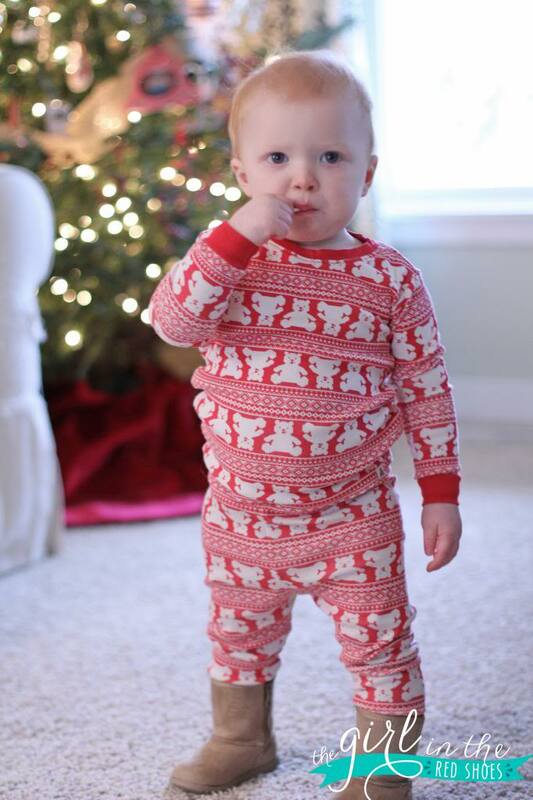 I've decided there is nothing cuter than Christmas jammies and Hudson is proof! The red ones are my favorite too! Such a fun link-up! 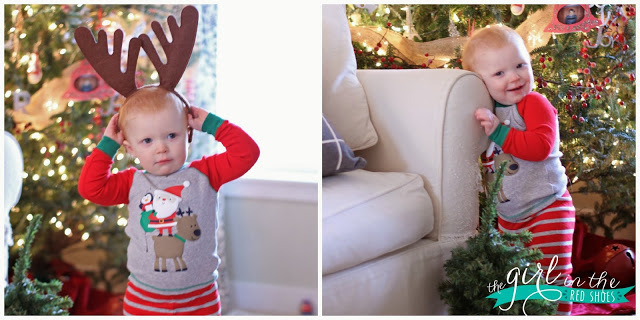 I am a total sucker for Christmas jammies – the hard part of sharing some of Caleb's today, was actually choosing which ones to share so my post wasn't ridiculously long, lol! 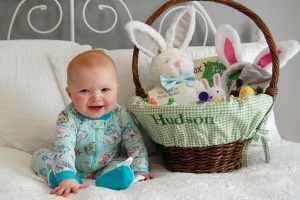 Loving all of Hudson's sleepwear – good choices, Mama! Those red and white long john style ones from Gap are precious! He is just too darn cute!! I love all his Christmas Jammies. my goodness he is too precious in those jams. love your idea for an embellished set every year. my mom just started appliquing so Im going to have to drop that hint in her ear! All of his pi's are SO cute!! I especially love the ones that say elf, adorable!! He is such a cutie patootie!! Love his jam jams! That WAS cuteness overload. He looks so cute in green, all those jams are awesome though. You really went all out on the variety this holiday =) Love it! Those Gap ones are so cute, definitely seen them around the blog world today! I love the belly. Look at all of these adorable photos! I'm in love with him in the green ones. He's so darn handsome. What a little ham too! 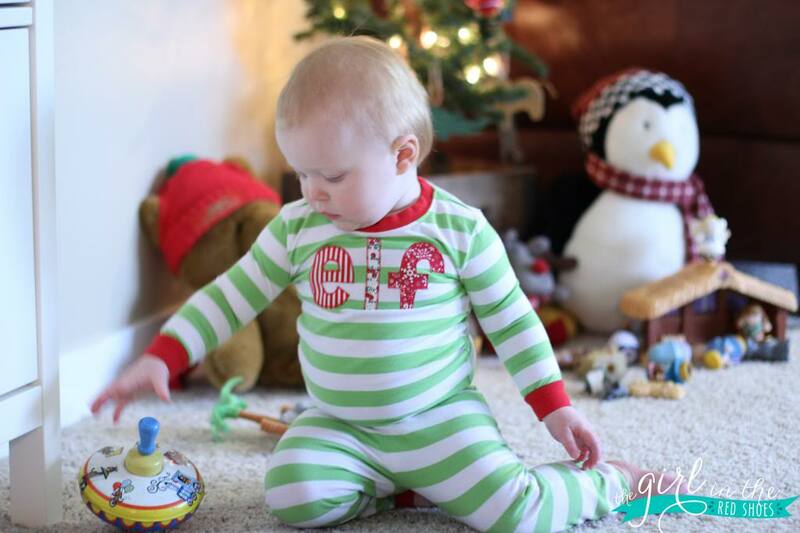 I am in LOVE with the elf striped Jammie's! Man he is so stinking cute! Thanks for hosting this link up! Thanks for your sweet comment. You little guy is too cute. I'm pretty sure Hudson should be a baby model!! The camera loves him. All of his jammies are too cute! Oh my, cuteness overload for sure!! I'm so excited to have found you thanks to this link up. Thanks again for hosting! Oh my goodness! I wish I had seen your blog sooner. I could have posted pictures of my baby girl in her pajamas today 🙁 I posted it yesterday. Oh well, love this PJ party! He is TOO cute! And I might've bought the Carter's pjs for next year as soon as I finished your post 🙂 It was too good of a deal to pass up! too much cuteness! we will be fashionably late to this party…hopefully tomorrow! Hi there! I found you from Living in Yellow and absolutely adore your blog. I wish I had found you sooner!!! I have a little one of my own (she's 5 months) and I so wish I had prepared a post showing off her cute little Christmas pjs. Such a cute idea!!! I am following along now so I can catch all of the good stuff you blog about. And I love your hair – my little one has bright red hair too. He looks like such a big boy with all those teeth!! Look at all of those pjs!!! He is adorable. Thanks for hosting the link up! My gosh what a Cutie! Love all his Jammie's! 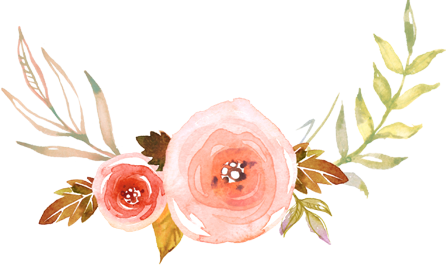 How is it I have never noticed your fabulous blog!!! Your little guy is adorable!!! I love the pjs that you had embellished. What a great idea! Hudson seriously has the cutest pjs! And that smile…to die for! So cute! What a cutie! Yes, the Gap pjs are just too cute. Wishing some for my lil guy and his toddler tummy;) Enjoyed linking up. Thanks for hosting! Hudson is so stinkin cute! He is adorable…especially in those first couple of pictures where he is smiling so big! 🙂 It's hard not to smile when looking at those! And your mom did so good on the "elf" PJs…love it. 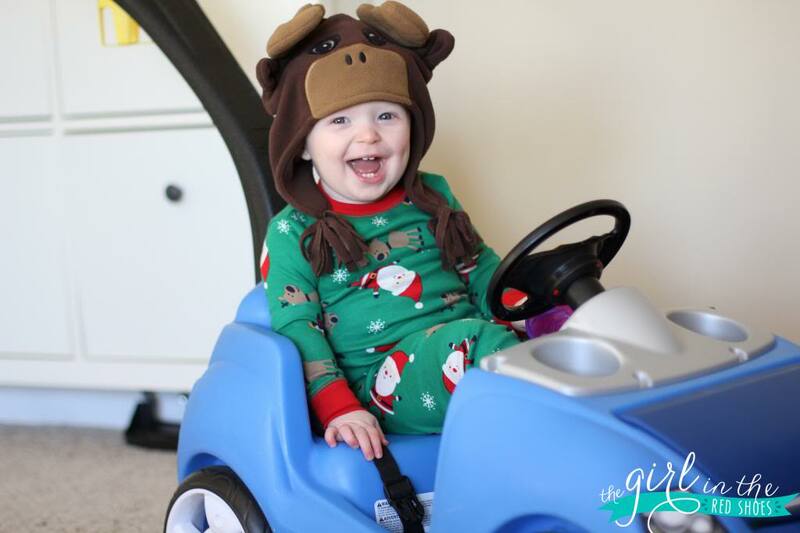 It's safe to say Hudson has no shortage of holiday jammies!